Who doesn't need a little extra storage space? Especially for more wine! While we all don't have space for a wine cellar, we all can make room for a wine rack. You'll be amazed at how many bottles this little beauty holds without taking up too much space. What's even more amazing is how easy it is to make this stylish, geometric version yourself (practically no woodworking skills required)! We recommend reading through all instructions first before jumping into this project. While this project might look complicated, it's easier than you think if you've mastered the art of the table saw. As always, you'll want to be careful and ask for help if you're not comfortable using the equipment. Always wear safety equipment like goggles when using power tools. 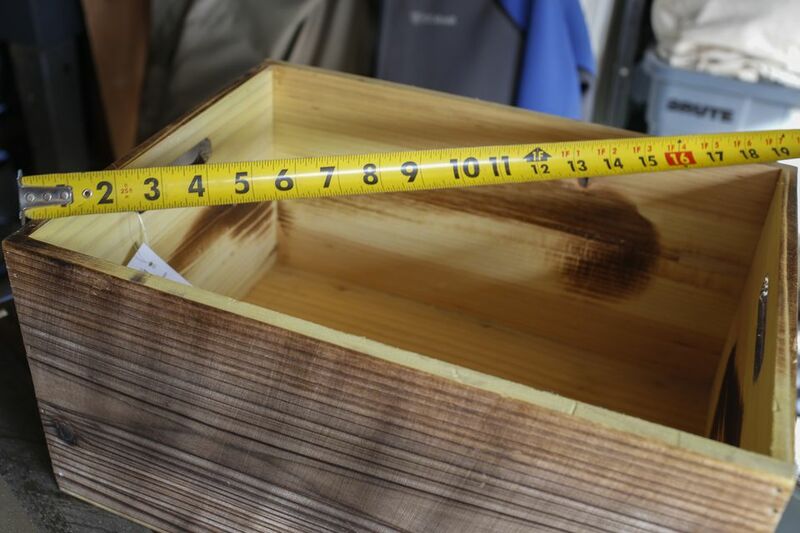 Measure your wood crate on a diagonal and then measure to see how deep the crate is. Cut your piece of spare plywood down to fit both measurements. You should now have a long piece of plywood that will go from one corner to the other inside the crate. Adjust your table saw so that it cuts an angle. Cut each end of the plywood at a forty five degree angle, so that you've formed a point that will fit into the corners of the crate. Note: It's important to create the shape at each end without losing too much of the length. With the second piece of plywood, cut the ends so it sits flush with one corner of the crate and the center piece of plywood. Once you have all of your pieces cut, gently wipe them down with a microfiber cloth or regular cloth to remove any excess dust so it doesn't get into the stain. Using a light hand, gently stain the wood pieces and even the inside of the box if you need to. If you want the stain to be a light color, you'll only need one coat. Once you have that first coat applied to all of the surfaces, using an old rag, gently wipe down the wood to remove any excess stain. This will give you a much less severe finish and will help cut down on drying time. As an alternative to staining the wood, you can also paint the wood whatever color will complement your decor. It's really important to let your wood pieces dry completely or overnight—whichever comes first. Once they've completely dried, fit your wood pieces into their intended spots. The beauty of this project is that if you've cut the wood pieces well enough, you won't even need glue to hold them in place; they'll sit properly on their own. Here's the most important part—find a place for your new wine rack in your dining room or kitchen and be sure to stock it with all of your favorites. Not only will it help keep these fragile bottles off the counter, it will help corral them all in one place where they are nice and easy to find. 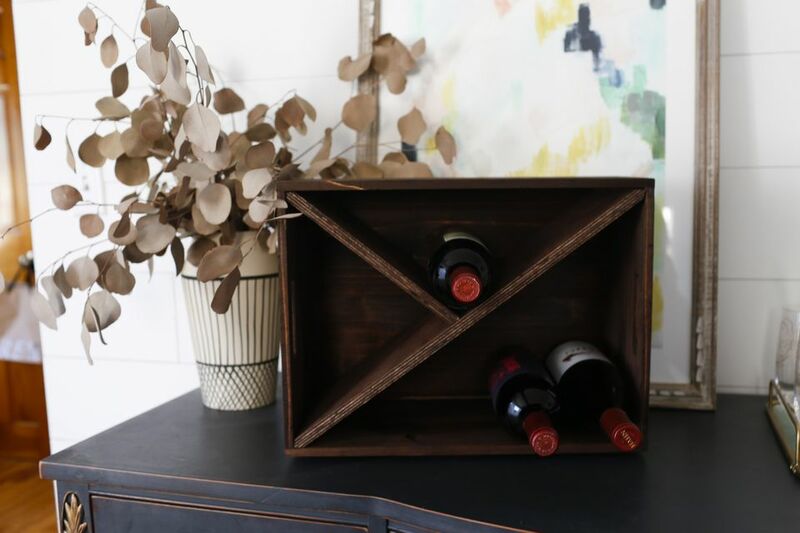 The next time you have dinner guests, offer up a glass of wine and wait for the compliments—people won't be able to believe that you made the wine rack yourself! Want to Spice up Your Space? Build This DIY Copper Magazine Rack!